Quick-relief by immediately lowering monthly payments. Reduce interest rates or balances, depending on the program you choose. The state of Missouri is deep in debt and can’t afford to get out. Missouri only has $8.3 billion of assets available to pay bills totaling $16.2 billion. And what’s worse is that the average household in Missouri holds over $10,000 in debt. At Golden Financial Services–we are determined to help improve the economy in Missouri. Last year alone, our debt relief programs chipped away hundreds of thousands of dollars in Missouri debt, and for 2018 we plan to help twice as many consumers. So let us lead by example in Missouri, and start taking the right steps towards getting out of debt! What makes Golden Financial Services the top-rated debt relief company in Missouri? Golden Financial Services offers debt settlement and negotiation services, debt validation programs, and debt consolidation. Other debt relief companies in Missouri, such as Freedom Debt Relief and National Debt Relief, only offer one program. Missouri residents are entitled to getting a free consultation with an IAPDA certified debt counselor that specializes in Missouri debt relief services. Golden Financial Services is the only company in the state that has more than 10-years in business and that maintains zero Better Business Bureau complaints. No other company offers debt relief programs that come with a “written guarantee” and “credit restoration”. What are my best options for debt relief in Missouri? Here is an infographic that illustrates all of the benefits and downsides of each debt relief program in Missouri. Debt settlement services were one of the first debt relief programs in Missouri, but over the years these services evolved. Now debt settlement is one of the last options that you want to consider. Debt settlement can save a person the most money, compared to any other program, but also comes with the worst effect on credit scores. 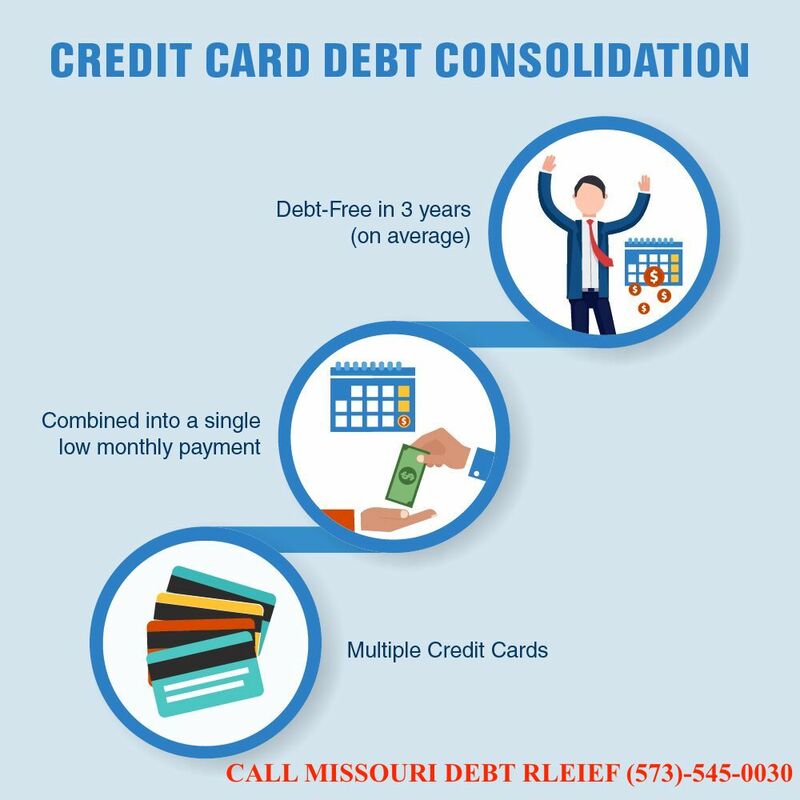 Missouri debt consolidation services are perfect IF you have a high credit score and sufficient income, but for consumers experiencing a financial hardship debt consolidation is not a viable option. We can consolidate your federal student loans and either offer debt validation or debt negotiation for your private loans. If you have over $100,000 in debt and multiple lawsuits, and your wages are about to be garnished, maybe you should consider bankruptcy, but 99% of the time at Golden Financial Services we can help you to AVOID BANKRUPTCY. To make life easier, talk to an IAPDA Certified Debt Relief Counselor. It’s FREE! Missouri debt relief, consolidation, and debt settlement programs can all be explained in a matter of minutes.